Music Costs > How Much Does a Saxophone Cost? A saxophone, just like the clarinet, is known to be a great starting point for someone who wants to learn how to play an instrument. Most widely known as a solo instrument, a saxophone can also be found in large ensembles, which include concerts, marching bands and jazz groups. The prices of saxophones greatly vary according to the brand, type the quality of sound that it produces and where you purchase it from. On average, a saxophone can cost anywhere from $300 for a simple student model to as much as $8,500 or more for a professional saxophone. Plan on spending around $1,100 to $4,000 for a reputable instrument. For those who are just starting off, a beginner’s kit/student model is something to look into. A student model can cost anywhere from $250 to as much as $1,200 and is recommended for the first two to three years before considering an upgrade. For example, the Conductor Model 300 Sax retails for about $275 to $550. For the intermediate saxophone players, these saxophones can range anywhere from $1,000 to $2,500, depending on the brand. An intermediate model will be a model that’s a pinch between a student and professional saxophone. If you are looking for a decent saxophone that is used for professionals, these prices can be all over the place, ranging anywhere from $2,000 to as much as $7,000. This price will highly depend on the materials it’s made from. Tenor saxophones can range from $750 to as much as $8,000; however, most purchases will be within the $1,100 to $3,200 price range. An Alto saxophone, which is ideal for both students and for those who are on an intermediate level, can cost anywhere from $250 to $5,000. Baritone saxophones can vary anywhere from $2,500 to as much as $7,000. A soprano saxophone can be anywhere from $600 to as much as $5,000. A higher end sax such as the Contrabass can cost upwards of $15,000 to $32,000 or more. An electric saxophone can cost about $500 to $800; again, depending on the brand. A mini saxophone, often purchased as a collectible, can cost about $50 to $100. 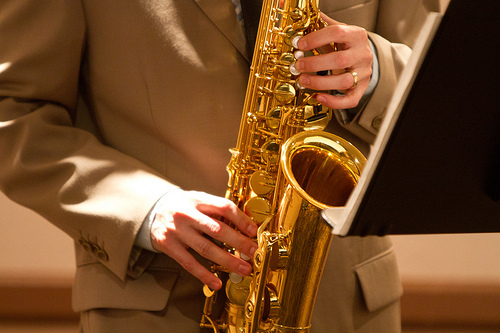 A saxophone can come in various sizes, including the Soprano, Alto, Tenor and Baritone. The Soprano will be either straight or curved and will be often difficult for beginners since the intonation is more challenging when compared to the Alto or Tenor. The Alto, like the Soprano will also be either curved or straight. The Alto is highly recommended for beginnings since playing the tune (intonation) is easier when compared to the other types, plus the size and shape make it easier to tote around, especially for younger children who are taking it to school. The Tenor is slightly larger than the Alto and will also have a larger-than-normal mouthpiece. Lastly, the Baritone will be the largest of the saxophone family. A mouthpiece is included, but there are other brands that include the musical accessories such as a neck strap, cleaning cloth and reeds. For new players, a method book will be highly recommended. Other must-have accessories, such as the reeds, neck strap, cork grease, and cleaning cloth, need to be considered. All of these accessories combined should cost about $50. As with anything, practice is highly recommended, and All Star Activities recommends a 30 to 60-minute professional lesson per week and practicing close to 30 minutes per day to retain the knowledge. These lessons, depending on who you hire, can cost about $25 to $40 per 30-minute lesson or upwards of $60 per 60-minute lesson. A beginner will usually need a number 1 1/2 or 2 reed, and according to All Star Activities, several reeds should be purchased at once since they tend to be replaced about every three weeks. With any musical instruments, repair may be necessary down the road. Depending on the repair, the costs can range anywhere from as little as replacing the blue needle springs for about $10 each to as much as $1,000+ to overhaul the entire saxophone. Repadding, a common repair job often performed, can cost about 10 to $35, depending on the size and type. This forum thread on Sax on the Web tells you which saxophone brands to avoid. What is the difference between alto and tenor sax? This is a question often brought up on countless saxophone message boards. The biggest difference is the size. This size difference, in turn, can create a difference in the notes it produces. Since the alto sax tends to be smaller, it will create a higher note when compared to the tenor. Also, due to this smaller size, younger players, especially those who are just starting out, will find their smaller hands and lungs can make it easier to play the instrument. If you’re new to the instrument and you have no idea if you’re even going to like playing it, consider renting one for a few months to get a feel for it. While renting doesn’t make sense long term since the fees add up, it can save you from spending thousands if you don’t want to invest the time to learn the instrument. The Hub says a very playable student version can often be purchased for less than the cost of a year’s rental. Even when you want to upgrade, players are often surprised at how much they can recoup in terms of cost. Rentals, if you do go this route, will be about $45 to $65 per month. A used one could save you more than 40 percent. eBay and Craigslist have thousands of listings to browse through.